Have a great day off. See you tomorrow! If you have an account, log in. If you've forgot your account, there are ways to find it through the log in page. If you do not have an account, click 'Apply for an iGEM and Registry account' and apply for an account. This will log you in as a visitor. Use the Joining Code "8f1024" to join the course, and then fill in the rest of the form. Once you are done, you will be taken to the course page. And "wallah"--you're a member of the Registry--pending approval. Once you have been approved as a member of our class registry group, you and your project team should identify a part that you'd like to spotlight from your project and then enter it into the Registry. See the details of this requirement here. You need not do this today but begin to think and talk about it. *In case you find it helpful, a link that shows you how to enter a part is here! Not all engineers are pessimists but since good designs anticipate failure modes, many engineers must at least consider Murphy’s Law (what can go wrong will go wrong) as they flesh out the details of their designs. Like Daedalus’ wax wings flown too close to the sun, even designs that work well have limits and breaking points. If an engineered object is to work reliably, then the designers will have to carefully examine its multiple points of failure, including the three that today’s challenges address: extreme forces, performance variations, and human fallibility. Boxes of paper clips don’t usually come with “ a money back guarantee” since nearly everyone in the world who uses paperclips finds them a reliable way to hold a few pieces of paper together. But bend the paperclip wide a few times and it’s likely to break. How many times will that be? We’ll do a quick experiment to find out. 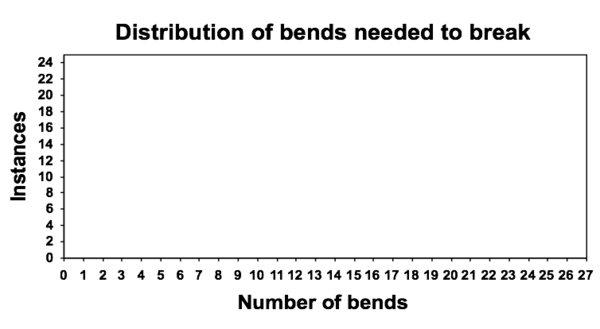 Each of you will bend a paperclip back and forth until it breaks and we’ll plot the data on a histogram. Did all the paperclips break after the same number of bends? If so, why? If not, why not? As you've seen these affect each paperclip to differing degrees. When thinking about biotechnologies, what is akin to “material fatigue”? What situations might be considered uncharacteristic? How cell to cell differences can be taken into account is touched on in the next challenge but here let's apply material and use variations to the Eau d’coli project from the MIT 2006 iGEM team. The first challenge today addressed catastrophic failure--if breaking a paperclip can be called “catastrophic.” The activity makes clear how engineers can enhance reliability by anticipating then obviating failure modes. Certainly, weaknesses can be tested and quantified, leading to reliability terms such as the "MTTF" (Mean Time To Failure). And certainly there are simple things to try that lengthen “MTTF” such as specifying operating conditions (“don’t repeatedly bend the open clip back and forth") or including redundant functions (“use two paper clips when in doubt”). But catastrophic failure is only one way to fail. Today’s second challenge will consider another mode of failure, namely unreliable performance. The framework presented here is attributed to Reshma Shetty and the thesis work she did in the labs of Tom Knight and Drew Endy. She has developed a framework for characterizing transcription-based logic devices that we will modify to talk about system-level behavior. To introduce digital devices and means for guiding reliable behavior, we'll watch the BioBuilder animation that introduces digital devices. There's an interesting recent editorial here that directly addresses the (un)reliable performance of biological systems. The inverter's transfer curve should remind you, just a little, of the shape of the curves we’ve already seen for the wintergreen and banana smell generators in the Eau d'coli project. 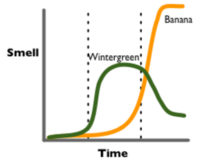 Recall that the devices in this cell are controlled so that the wintergreen scent is generated only in log phase growth of the cell and the banana scent is generated only in stationary phase. The wintergreen scent, for instance, is programmed by a combination of a sensor (stationary phase promoter), a logic device (inverter), and an actuator (odor production). In fact if you examine the system level diagram that the team specified you'll see an inverter device regulating the conversion of salicylic acid to methyl salycilate. 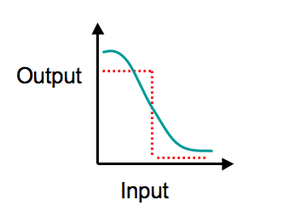 Mapping the log-to-stationary phase concentration of methylsalycilate (in green) to the digital transfer curve (in red), you can see that activity of the green boxed wintergreen-generating device is swinging from a high value to a low value but the trip point (the input value at which the device inverts the output signal) is not precise. To impose digital logic on the analog signal, we'll have to impose thresholds. 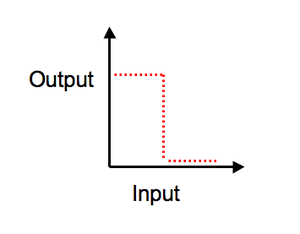 Thresholds designate a value above which the input for the device will be given a logic value = 1 and below which the logic value will = 0. You'll note that the thresholds still leave some values that have unspecified consequences for the operation of the device. You'll also note that the steeper the slope of the curve, the more accurately the gated signals will perform. Please note that we have modified a framework that's useful for characterizing individual devices (e.g. sensors, logic devices, actuators) in order to describe the behavior of a system built with those devices. We've done this to help think about reliability in performance. Once your understanding of this description is solid for the system overall, it's worth thinking about the performance of each device that comprises the system and what the error rates might be for each. 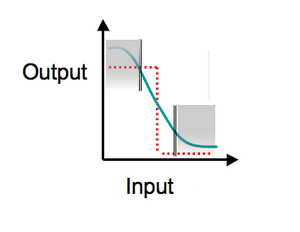 An example of an input/output analysis for the stationary phase sensor itself and in combination with the inverter is here. 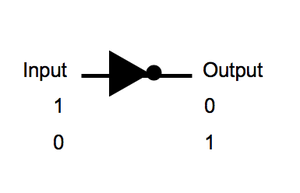 What would be the consequence of a 10% error in the logic output for the wintergreen generating device? Would this be a tolerable error rate for this system? Would a 10% error rate be acceptable for a device in your own project? Why or why not? Here’s a story that’s been passed from teacher to teacher: 2 students spend the night before their big final exam at a party and they end up sleeping through the test. They tell the teacher that a flat tire is what kept them from the exam and the teacher, seemingly gullible, lets them retake the exam in separate rooms. The exam has only one question: which tire? Very cute. Very clever. But is it true or urban myth? How do you know? Today you’ll have a chance to sniff out fact from fiction with a scientific game of “I doubt it.” You’ll hear three short stories from the scientific literature and you need to pick the fake one from the mix. This sniffing out of the truth will be harder than you might think. 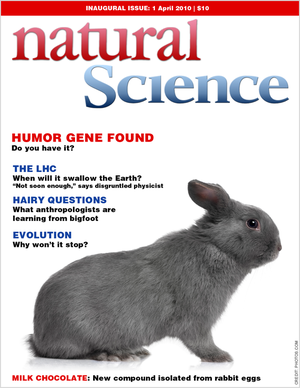 For one thing, these stories will be drawn from recent scientific developments and nature is incredibly imaginative. Consequently things that sound impossible turn out to be very real. In addition, there is often a personal set of beliefs that everyone works within, making stories that validate or reinforce those beliefs seem more plausible. One instance of such bias is the hoax article about climate change that many bloggers righteously touted as the truth revealed. PS The tire story turns out to be largely true as reported by the Chronicle of Higher Education. Many thanks to Duke Chemistry Prof. James Bonk for a great, mostly true story to tell. Please plan for your team to give a 10 minute update before class ends on the state of your project and any outstanding issues and questions your team is wrestling with. In a few weeks there will be an opportunity to talk with experts in the field who are more directly familiar with your project's content. By presenting out at the end of class today, I can begin to arrange for these conversations. Before Friday, please add some thoughts to the class blog. This will be the fifth of 6 entries you'll make this term. This page was last edited on 18 April 2012, at 11:53.